"When Sadie Lapp steps off the bus in Stoney Ridge after being in Ohio for the winter, she is faced with a decision–one that goes against her very essence. Yet it’s the only way she can think of to protect a loved one. Another visit with the Lapp family = another enjoyable experience. Because of events concluded in the first book of the series, The Keeper, the Lapp-family dynamic has changed, and new events and feelings bring about even more change at the beginning of The Haven. One thing is for sure - Fisher's Amish novels are full of surprises and rather unique situations! This is one of those sequels that was pleasant for me to read because the characters, as well as the author's writing style, have become familiar to me. Not surprisingly for an Amish story, the pace is gentle and steady, and the pleasure comes in seeing how this quirky family and their friends (both old and new) deal with growing up, falling in love, and trying to do the right thing. M.K. 's antics get her into trouble (no surprise there! ); Sadie's surprise is a challenging one; Gideon's attempts at reconciliation are met with misunderstanding at every turn; the new boy on the farm has a past to face... And basically it takes a while for all the craziness to get sorted! As an interesting addition to a collection of great Amish stories from Fisher's pen, The Haven fits the bill. There are some moments - both hilarious and sweet - that stand out in this installment. However, the ending leaves a bit to be desired... Sometimes a conclusion that doesn't answer every question works, but this is one of those times where I felt like some more resolution would have been better. One of Fisher's previous novels, The Search, had a wonderful ending, in my opinion - even if it wasn't exactly the standard happily-ever-after. With this particular ending, though, it just didn't resonate in a similar way with me. But all in all, this return visit to Stoney Ridge was a sweet one. "Suzanne Woods Fisher’s interest in the Amish began with her grandfather, W.D. Benedict, who was raised Plain. Suzanne has a great admiration for the Plain people and believes they provide wonderful examples to the world. In both her fiction and non-fiction books, she has an underlying theme: You don’t have to 'go Amish' to incorporate many of their principles–simplicity, living with less, appreciating nature, forgiving others more readily– into your life. To Suzanne’s way of thinking, you just can’t take life too seriously when a puppy is tearing through your house with someone’s underwear in its mouth. Suzanne can be found on-line at: www.suzannewoodsfisher.com." In a few short days the third annual "End of Summer Bash" will be here! I'll be hosting five wonderful authors, and the interviews will be summer and fall-themed in order to celebrate the change of seasons. There will be music, sneak peeks, insights into characters, and giveaways! I'm really excited to get this party started!! P.S. I'm not offering extra entries this year (just one entry per person, per giveaway - keeping it simple! ), but if you wanted to take the button in the sidebar and help spread the word about the bash, that would be awesome! Thank you! I also read several books for fun (I know, right?? ), including Entwined by Heather Dixon, which ended up being an absolute favorite of mine!! Amazing book!! So, this was a pretty productive reading month! ;) I didn't actually end up watching any Christy episodes...but I did watch some other movies, so it's all good! Plus, I got to go to Disneyland with my family, which was a really big treat!! 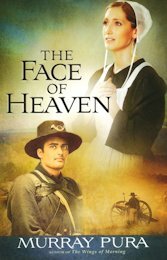 The Face of Heaven is a book that is grand in scope and appeals to the intellect. I found the history of the American Civil War presented within the pages to be detailed and well-researched (as is also shown by the acknowledgements page). Numerous instances in the story give rise to little tidbits about the era or varying perspectives on why things happened the way they did or clashing beliefs that caused so much turmoil. So as far as the setting and the context goes, this book is thorough. I wish I could say the same for the characterization. This could very well just be a personal thing, but I had a difficult time truly caring about the characters. At times the omniscient narrator seemed to be holding me back, helping me to remain an observer rather than a "participant" in the events. There were some really sentimental things that happened in the book, but for some reason I just never completely got into the minds of the characters, and it made it more of a struggle to push through the pages. Plus, I wish the interactions between the hero and the heroine could be more authentic. It's not that I want people to fight more, but I just don't think that relationships are generally so "perfect" - especially during a time when emotions and tension would have been running terribly high. 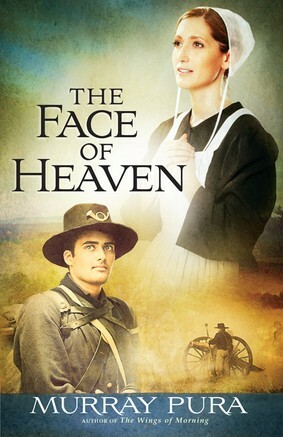 As far as being a "snapshot in history," as this series claims, The Face of Heaven portrays debates and details well. But as far as being a love story, I was left disappointed. And the sun went dark." The song "Galaxies" by Owl City is full of emotion - both pain and joy, questions and yet determination. But where is the joy and the determination? God has provided for me thus far. I'm blessed beyond measure! Do I think He's not going to guide me? Do I fear that He's leaving me in the dark? 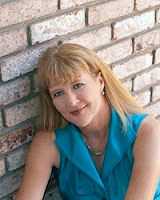 Author MaryLu Tyndall wrote a beautiful post today about "Eternity and Provision in Every Step." In it she reminds us that God truly cares about us, and we should have deep peace knowing that God is with us at every step and that He has prepared things for us - a path, a purpose, and grace for the journey. I can't help but wonder - when I feel neglected and uninformed and lost, is it because I'm looking at a fork in the road way up ahead? Maybe I'm expecting my next step to be one that takes me over there, when I should be focusing on what God wants me to do right here, right now. I taught Ephraim also to go, taking them by their arms; but they knew not that I healed them. I drew them with cords of a man, with bands of love: and I was to them as they that take off the yoke on their jaws, and I laid meat unto them." "...they knew not that I healed them." God cradled the people of Israel, protecting them and providing for them. But they didn't recognize that God healed them, or that He acted out of love for them. I'm sure I'm too often guilty of the same, and how it must break God's heart. I still have so much to learn about trusting in the Lord, about seeking His guidance but also living for Him where I am, and recognizing His goodness to me, and resting in His plan and His timing. Lest I blink and get swept off the narrow road." "Dear God, You're the only North Star I would follow this far." "Before Anna Prentiss can start nursing school in New York, her brother sends her to Cades Cove, deep in the Smoky Mountains, to spend a summer apprenticing to the local midwife. Anna is determined to prove herself and then head to the big city. 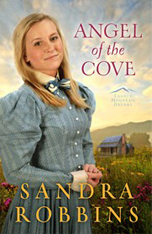 But nothing could have prepared Anna for the beauty of the Cove, the community and friendships she finds there, or the feelings Simon Martin, the handsome young minister, arouses in her. Has God’s plan for Anna changed? Or is she just starting to hear Him clearly?" For a sweet summer setting, Cades Cove is the place to visit! Tucked away into the Smoky Mountains (a setting reminiscent of Christy by Catherine Marshall), Cades Cove is a delightful retreat with a dear community and lovely, rustic scenery. Anna Prentiss' experiences as an apprentice to the well-beloved midwife of the Cove, Granny, are informative, suspenseful, and uplifting. The "summer-lovin'" drama feels a bit over-exaggerated at times, but overall the romance is enjoyable to read about. And the tidbits of wisdom from the kind and generous Granny, as well as the lessons on friendship and understanding, round out the story in a meaningful way. While perhaps not extremely original (after all, Christy fans will find the setting, the pastor-love-interest, the attitudes of the Cove residents, and the strong female mentor to be nothing new), Robbins' story has its own charm. The details regarding midwifery are interesting, and Anna's challenges as a newcomer to the Cove are unique. "Twenty-two-year-old Luellen O'Connell is stunned and confused when her husband of just one month tells her he is leaving her. Deeply wounded by this betrayal, Luellen decides to follow the dream she had set aside of obtaining a teaching degree. More than anything, she wants to teach children in communities like hers and help them recognize that education opens a path to future possibilities. But her wayward husband left something behind when he abandoned her. Can Luellen overcome the odds and achieve her dream? Can she hide her secret, or will it destroy her dreams forever? 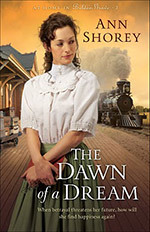 A moving story of tenacity and perseverance in the face of opposition, The Dawn of a Dream will inspire readers to discover and follow their own dreams." With an abrupt first chapter, The Dawn of a Dream didn't charm me the first time I tried to jump in. But once I came back to it and really settled in for the ride, I found this book to be a gentle, well-written story that contains elements that alternately won me over and frustrated me. Honestly, I think The Dawn of a Dream is a great book. Luellen is a heroine most people who pick up this book will understand and admire. She's a determined young woman who doesn't let anything get her down. She is humble enough to seek out help (well, sometimes) and yet proud enough to keep on fighting for her dream and to hold onto her own responsibilities. But I think it's her character that frustrated me the most. It's quite possible that the reason for that is the similarities between my personality and hers... Academics have always been very important to me, so I understand Luellen's attitude and some of her choices, and I can't be sure I wouldn't make some of the same mistakes she does if I were in her place and time. However, there is just something about how she acts in certain parts of the book - mainly her single-mindedness - that just irks me. She shows some growth in her thinking, but the perspective we're given of her (the scenes included, as well as the scenes that are not included) didn't completely work for me. The way the book is written, though, is engaging - plenty of drama and secrets that made me want to know what would happen next and how everything would turn out. The romance isn't overly prominent, and yet there was enough to keep me satisfied - especially with such a sweet hero who is unassuming and steps into the picture softly, yet turns out to be a strong character with his own important issues to face. If I liken the reading of this book to a train ride (and I love the train on the front and back covers, by the way! ), I would say that the scenery I can see from the windows is wonderful, and the thrill of a good old-fashioned ride is great fun, but I'm not exactly sure where my destination is. Translation of my analogy: I enjoyed the reading experience, and the story is well-executed in terms of plot and hooks. But while I admire the heroine's tenacity, I'm not sure how I feel about the message of the book - or if I even grasped it the way the author intended it. Is the heroine really passionate about the people she can help (as well as those she loves) - or is she just passionate about reaching the dream for her own benefit/security/pride? I'm just conflicted about the way the dream-theme is presented. With an intriguing premise and a compelling beginning, The Face of Heaven has been an interesting read so far (I'm about 1/3 of the way through the book). Since I took a class specifically on Civil War Era history last fall, as well as an American Military History class (from the Colonial Wars through Reconstruction) last spring, I thought this combination of the Amish and that turbulent time would make for a thought-provoking story. And it has been thought-provoking, although the storytelling hasn't completely pulled me in. We'll see how the next 2/3 goes! My full review should hopefully be posted soon. Re-reading vs. Re-watching: What is my problem?? Why is it that I can watch the same movie over and over again, but I have a difficult time picking up a book I've already read? I know there are people out there who talk about how they love a book so much, they've read it multiple times. And yet, I only re-read three books for the Contentment Reading Challenge 2011, and I haven't really re-read much else without being forced to do so. So, what is my problem?? If it had to do with a loss of surprise (i.e. : I already know the whole plot, including the ending), then I wouldn't like to re-watch movies for the same reason. There are movies I've seen a gazillion times (give or take a time or two), and I still love them, despite the fact that I can quote them almost word-for-word (and annoy the people I'm watching with). Perhaps part of it has to do with the time commitment. When I sit down to watch a movie, generally I'm devoting an hour and a half to two hours of my time. But when I sit down to read a book, it takes a lot longer, especially if I have to read between other commitments (we're talking days). Another big part of it has to do with greediness and the book-reviewer syndrome. You know what I'm talking about, right?? There are so many great, new books coming out all the time!! And my TBR stack just keeps getting bigger and bigger... Why re-read books when you have so many new ones you haven't even read once? *Sigh* I sound so spoiled! I mean, how blessed am I to have so much reading material?? I think if I took the time to consider what would cause me to re-read a book - and if I reminded myself how many wonderful books I have read - maybe I would be encouraged to re-read more and not be so enamored with the new. (Not that there's anything wrong with enjoying new, unread books! I just want to understand the pleasures of re-reading more.) Worth a try, I hope! The Music - In a movie, the music really can make a big difference. And it's not just the soundtracks with lyrics (although I enjoy those, too!). Consider the BBC Sherlock series, or Kate & Leopold, or Tuck Everlasting, or How to Train Your Dragon. The music sets the scene and draws you in emotionally. I think the books that I would be more inspired to re-read are the ones that have a certain "music" to them - those books that are well-written and have their own unique, engaging style that makes me feel involved in the story and intrigued by the way the author strings words together. The Setting - It's the place you want to re-visit. Like beautiful Ireland in Leap Year or New Orleans in The Princess and the Frog or Radiator Springs in Cars. The Dialogue - My family and I kind of have our own language, and you'd have to have seen a lot of random movies in order to get it. You see, we quote movies all the time. I'm not sure this comes off quite the same in books (after all, you're reading it, not hearing it). But still - some great dialogue can make you want to re-live the wit or the zingers or what-have-you. The Characters - When characters become so dear that they're like family, or so similar to yourself that they're like your best friends, or so intriguing that you just want to try harder to understand them...that's when you want to spend more time with them. The Theme - Sometimes you need to reminded of something important. That's one thing I love about Hallmark movies and ones like them (the tear-jerkers) - they often help me put things in perspective. Even though it isn't always fun to watch or read about things like war and losing a loved one, those sorts of stories remind us of how precious life is, and how much we need to cling to hope. Basically, I think the stories we want to re-discover and enjoy more than once are the ones that contain a journey we need/want to take over and over again. It doesn't matter that you've read or seen it before. Each time you take the journey, you learn something new and yet find comfort in the familiarity of it. Like a good friendship, it helps you grow while offering you something stable. You know the plot and are guaranteed a happy ending (generally! ), but each new viewing/reading encourages and inspires you in new ways. At least, that's why I like watching certain movies over and over again. And I hope that this exercise will show me that some books are worth the time investment of a re-visit! A Big Smile for the Road! Like the Cheshire Cat, I have every reason to smile wide today - 'cause, Lord willing, we're on our way to Disneyland! For now, I've got a couple of books and a Kindle to keep me company down South and back, and a few days of magical fun in the sun - so I'm planning to enjoy it! I'm sorry I haven't had more Driving Diary posts or more vacation posts. We'll see what I end up posting in the coming weeks! I do know that the annual "End of Summer Bash" is planned for that first week in September (the 3rd through the 8th), so keep that in mind! 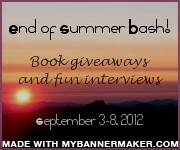 I'm excited about the author interviews and giveaways - it should be lots of fun! How has summer been treating you? Are you fitting in some family-fun time this month? 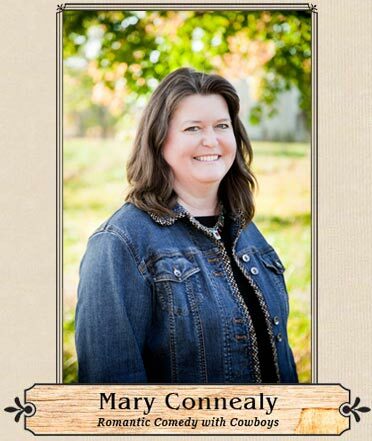 Mary Connealy's Wild West stories are always a good time, full of humor and excitement, as any fan of hers will tell you! And her conclusions to her trilogies (at least the ones I've read) seem to be lots of fun for fans as they bring together a whole cast of characters to whom the reader has been previously introduced. Over the Edge is just such a story that is probably better appreciated by those readers who have read Out of Control and In Too Deep. (I've read the first but not the second in this series.) However, for those who like Connealy's entertaining style, I think it safe to say you can join the bandwagon any time and still have a good time. This particular installment starts off by introducing a crazy-tough heroine in the shoot-out of the 19th century (or at least one intense fight!). Callie is quite the foil for Seth - even though Seth fits into his cowboy boots just fine, he's rather more sentimental in nature and fun-loving than Callie, and I found him to be a more likeable character. He's really just a danger-craving, romp-in-the-dirt boy in a man's body, although he does have his mature moments. The one thing I personally would've liked to have been told in the synopsis is that Callie has a son, Connor. Perhaps it comes as a surprise to those truly invested in the series - I'm not sure. But otherwise the reader knows right from the very first chapter about it, so I'm not sure why it isn't mentioned. It's not that I don't like stories with a child (or children) as a main character... I think that because of where I am in life, they're just not my favorite. Maybe when I'm a mother I'll enjoy stories about mothers more! Overall, Over the Edge is a fun journey. It doesn't stand out as a favorite for me out of all the Mary Connealy books I've read, but it's still a good read that shares a similar theme with Deep Trouble regarding the true treasures worth fighting for in life and the dangers of greed. All of Sheri Rose’s best teaching in one great book. Refresh your soul and enjoy a journey as you draw close to your Prince…Jesus. Filled with heartwarming stories, life changing truth and the timeless wisdom of the word of God, this inspiring book gives all of us an eternal view of who we really are: 'The Bride of Christ.' It hits the heart of every woman who wants to experience true freedom. Great for group or personal study. 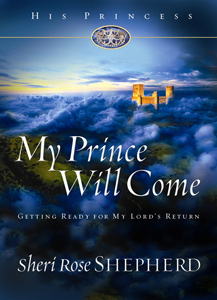 My Prince Will Come is a lovely little book - one that is what it says it is, although it seems to also reach for more than it can offer. That is to say, this book has it all: written prayers to read, encouraging and imaginative "letters from God," personal stories from the author's own life, and suggestions on how to approach everything from one's habits to one's relationships as a woman of God who is aware of eternity. But with all that it tries to tackle, it loses a bit of focus. The uniting factor is the princesses and "happily ever after" theme, which keeps everything on track. But there is some confusion even in the organization of the book: is it a daily devotional or is it a "self-help" book? If it was divided a bit differently, it could read rather like a devotional. But the four chapters with subdivisions make it possible to just approach it as a shorter non-fiction read. Going off of the synopsis and the evident theme displayed on the cover, My Prince Will Come delivers. It didn't completely engross me for the most part, but once I finally took the time to sit down and read it, I found that there were some powerful personal testimonies and some great words of advice - especially in the chapter regarding relationships. In some respects the book comes off as a bit shallow and "fluffy," with imaginary "love letters" from God and princess references and acronyms (etc.). But the Scripture scattered throughout, the important and helpful issues addressed, and the quality of writing keep things balanced. For those already skeptical about the book, I think there are some good points to be found if one keeps an open mind. For those who are already hooked on the premise, I think this book can be an enjoyable read - just don't let the "love letters" and prayers included substitute for studying the Scriptures for yourself and praying openly to God (a reminder which the author seems to advocate, as well). "Rumors of dirty cops, midnight meetings on Friday the thirteenth, and a forested militia masquerading as a religious cult--these and other peculiar elements complicate the senseless murder of Deputy Sheriff Baxter Dunn, son-in-law of Christine's best friend, Zora Jane Callahan. The subject may be frightful, but our amateur sleuth tackles it with her characteristic blend of nosiness and tenacity, especially after Molly her beloved border collie is dog napped in retaliation for Christine's intrusion into matters that are clearly none of her business. National media attention fuels the escalating conflict between Christine and the authorities. Suspicions grow concerning which of the lawmen--if any--can be trusted. When a second murder jolts the tranquil community, Christine gets tagged as the prime suspect. Where is God in this? And who will rescue Molly if Christine ends up behind bars?" The story is told from Christine's point-of-view (first person), so it's easy to either be highly amused by her antics or to just plain be annoyed. Because of some of her interactions with others (like her husband), I'm not fully on the latter end of the spectrum, but pretty close. For a book that highly prizes the Truth, Christine doesn't seem to be above evading it in personal matters in order to protect herself from a lecture or to get away with what she wants. One of the discussion questions at the end suggests that the author made Christine to be a flawed character whose every decision should probably not be emulated...but at the same time, there seems to be mixed messages about truth when Christine constantly makes the same mistakes while the case is ultimately solved. Christine's husband, Jesse, comes across as wishy-washy on occasion, not quite determined enough to really work through some of these issues. However, the romance between this older couple is quite wonderful. It's fun to see the protective nature and the caring ways of a couple whose honeymoon ended many years ago. Jesse is a unique and adorable hero! As for Molly, the pet modeled on the cover, I'm torn. She is a sweet addition to the story, but her addition sometimes comes across as forced. Perhaps in Payne and Misery (the first book in this series), Molly's role is more established, so readers who then pick up this book know the connection between pet and owner. I'm just not sure. For me, Molly's part kind of gets shuffled in later on after the groundwork has already been established, and I just didn't get to experience much of a connection. That wouldn't be quite so vital if it wasn't for the fact that Christine makes some very poor decisions (in my opinion) in order to help her dog. In a book with such a strong evangelical slant, the instances where a dog's life appears to be valued more than a person's safety bothered me. 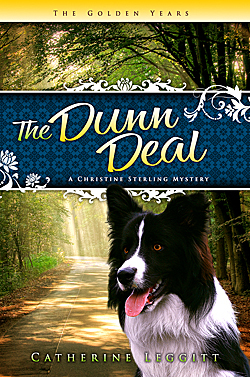 All in all, The Dunn Deal is certainly an interesting read, with plenty of discussions to listen in on and even some action to keep the tension high. For those who enjoy a good mystery starring a more mature couple, you might want to give this a try - perhaps keeping in mind the previously mentioned issues that stood out to me. 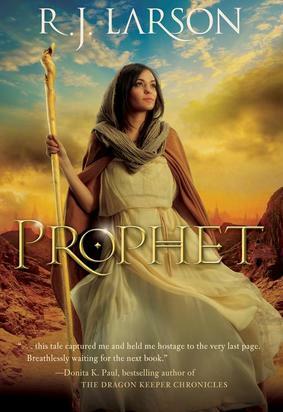 Epic fantasy with a "flavor" of biblical times - Prophet is certainly an imaginative and well-written addition to Christian fiction! The rigors of a prophet's journey, from the physical pain endured to the ridicule received and the heartbreak felt, are detailed in a world that is generally familiar enough to picture and yet "far out" enough to be fantastical. Dangers abound everywhere, but the One communicating through His prophet is close at hand - in control at all times and offering grace and justice in turn. For those who aren't fantasy or biblical fiction fans, this book might be a bit difficult to traverse through. At one point Ela (the prophet) compares herself to an ambassador - so you know the story involves a fair amount of diplomacy and national/international matters. This isn't just a tale about a prophet; it's a tale about the people and nations who choose to either act on or reject the words of the Infinite. It's a grand story, but I confess that I didn't have much of a problem putting it down...and not picking it back up again much until I forced myself to finish it. But I discovered that there is some romance woven in, and even some cute scenes involving a destroyer (think very big horse). Sometimes the interactions between the hero, the heroine, and the horse even brought to mind the teasing and the antics of Rapunzel, Flynn, and a certain horse in the Disney movie Tangled, believe it or not! Ultimately, Prophet offers a unique take on the prophets of old, as well as a reminder of how awesome and how loving God is. The fantasy elements might make the story hard to get into for those who don't normally read fantasy, but I think the story is rewarding if you persevere.